On May 14, 2018, the popular meal kit service Blue Apron announced that it will be organizing a number of pop-up events in cities across America. These experiential events are meant to bring Blue Apron fans closer together, establish a tighter bond between Blue Apron and its current and future patrons, and celebrate the art of home cooking. 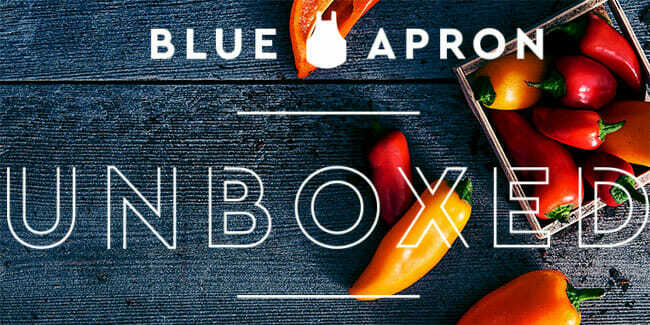 The series of events is titled Unboxed and Blue Apron plans to pop up in New York, Los Angeles, San Francisco, Seattle, Austin, Dallas, and Minneapolis. In New York, Blue Apron will set up a temporary retail shop on May 29, 2018. The shop will be open until the end of June 2018. Visitors will be able to enjoy various cooking-and-food-related activities 6 days a week (the shop will be closed on Mondays). The planned activities include recipe tastings, which will take place during the day, and fun cooking demos, classes, and discussions during the evening. Most of the activities will be available free of charge while the cooking classes will come with a small fee. All earnings will go to the world’s first food rescue organization called City Harvest, whose goal is to feed more than a million of New York residents who are suffering from starvation. In Los Angeles, San Francisco, and Seattle, Blue Apron fans will be able to visit 2-day mobile pop-ups called Blue Apron On Wheels. The mobile pop-ups will allow the visitors to learn more about the way Blue Apron works and discover every detail of the meal kit creation process. Plus, they will hear exciting stories from Blue Apron’s amazing chefs. More details about LA, San Francisco, and Seattle events are yet to be published on Blue Apron’s official website. In Austin, Dallas, and Minneapolis, Blue Apron will organize lawn games, photo ops, hosted games, and recipe sampling that will take place until sunset, after which the visitors will get to enjoy outdoor movie screenings. Blue Apron Unboxed will be in Austin on May 19, 2018, and it will pop up in Dallas on June 16, 2018. The exact date and details regarding the Minneapolis event are yet to be announced. We have to say that these sound like a whole lot of fun, so if you live in one of these cities or plan on visiting soon, be sure to stop by one of the great events Blue Apron has planned for its fans.